Egypt is truly a land of mystery. While there are many secrets lost to the ages here the bustling excitement of modern Cairo hides just as many stories as are buried under the whites sands and black sands of the desert. This first image is of a faceless deity from Karnak temple.When the Bamiyan Buddhas were destroyed in Afghanistan in 2001, the main argument used by the Taliban was that the depiction of deities in art wasforbidden. Until visiting Karnak, I was under the impression that this belief would have led to the destruction of entire works; of paintings, statues, murals, and buildings. The scale of the larger temples in Egypt is astounding. I hesitate to make a modern day example, but those formerly towering Ikea and Costco superstores seem tiny now that I’ve returned from Egypt. I wish there were other massive-scale architectural feats of the modern era to draw a comparison to, but there aren’t many that come to mind beside the temples to the almighty dollar. I’d known that a lot of the ancient Egyptian temples had been harmed by vandals and graffiti over the centuries, but was surprised to see that the clothes, accessories and inanimate objects surrounding the figures in the murals were very clearly preserved. It was only the faces, arms and exposed skin of the figures that had been painstakingly scraped away, and scratched away using crude tools. I can see this happening to a couple dozen figures, but shockingly every single face appearing in wall murals around Luxor and Aswan, that weren’t hidden away in sandy tombs until the modern era, were completely chipped away. For some reason, I found the stares of these hundreds of faces that weren’t there anymore, all the more haunting than the unearthed relics in museums that still had their features intact. The sands of the desert and the waters of the seas have much in common. Just as nearly-drowned sailors have recalled visions of mermaids in the deep seas, the vast, flowing sands have been known to consume entire villages, and unearth ancient vessels from a thousand year’s sleep. I felt the sands to be hypnotizing and enticing, despite their suffocating aridness, and long to hear the songs of the desert once again. Our small band of travelers made the journey towards Marsah Matruh, to visit the remote WWII graves of European soldiers at El Alamein. I’m not generally a superstitious person, but there were a few surprising happenings on this particular journey. To make it out, we had to board a bus from Alexandria. For the giant bus ‘terminals’ in rural Egyptian transport hubs, there are no terminal buildings, nor clearly marked signposts – In EITHER English or Arabic. Have you ever seen an old Western Cowboy movie, where dozens of stagecoaches form a caravan and circle around? Well, imagine that, but substitute close to a hundred minivans and a couple dozen buses. That is what the rural Egyptian bus ‘station’ looks like. It’d actually be a brilliant system once one becomes familiar with the language. The drivers call out their destinations, and as soon as enough passengers are gathered they will depart. The term ‘Mashrou’ roughly translates into ‘service taxi.’ Imagine the ‘airport shuttlebus’ system, but make it a lot cheaper, remove any roadworthiness examinations, and spread them all around the country for daily use. After negotiating with a couple dozen of these shuttle services, we realized that there weren’t any that were willing to make the journey out to El Alamein, since there weren’t ever enough passengers to make it a profitable route. One driver suggested that we take a service taxi out to a further out-of-town transport hub. It was from there that we caught the LAST BUS towards Siwa. That bus could drop us off within hiking distance of the El Alamein grounds. After passing the truck drivers, the rest of El Alamein seemed like a ghost town… Appropriately, I guess. Since my Grandfather had fought in WWII, and I was now living in Japan. I’d often been conscious of the effects of the War on the 21st century. Of course we all have. Of the Alamein battle, Winston Churchill said: “This is not the end, this is not the beginning, nor is it even the beginning of the end, but it is, perhaps, the end of the beginning.” WWII was a long fought-out battle, but the Battle of El Alamein is symbolic as the battle where the Allied Powers got an important foothold that helped them gain the momentum to begin ending the war. We arrived at the British tombs at around 3:00pm in the afternoon, and the first person we’d encountered in close to an hour of walking in the hot Egyptian sun was a security guard at the British Tomb entrance, who greeted us with the traditional x-shaped ‘no-entry’ guard gesture. After we asked persistently to be let in past the gate, he angrily pointed out that the closing time was 2:30pm, and that rules were rules. In Egypt, you eventually learn that ‘Rules are rules’ but ‘Baksheesh’ (tips) is the key to breaking ANY rule. “Hey, want to climb to the top of the pyramids? ?” $150 USD will help you do it at night. That’s $25 to each of the 6 guards surrounding it at night. 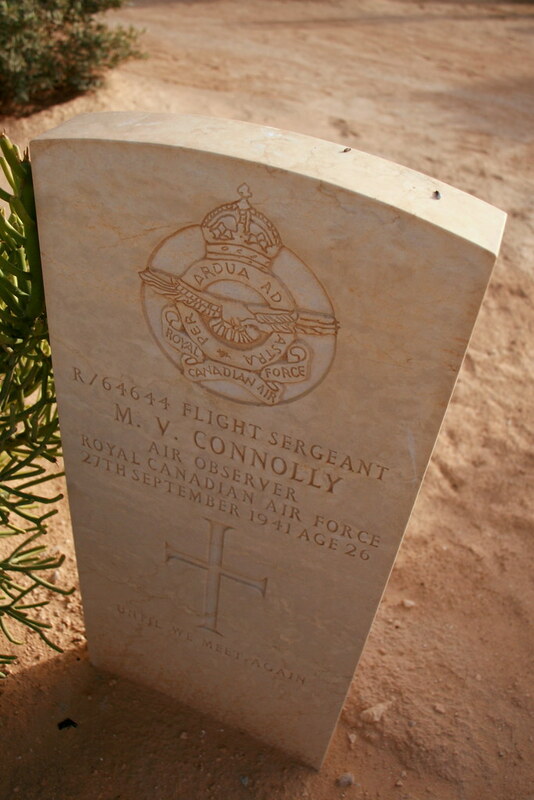 After ‘baksheesh’-ing him, I’d wondered if I might be able to find some distant relatives in the British cemetary of El Alamein, and searched around for ages. The gravestone infront of me. We continued to stroll along the thousands of graves that were set up along several memorial sites for soldiers from Britain, Italy, Germany, and various commonweath countries for much of the early evening. It wasn’t until we had hiked back to the highway, before we noticed in our guidebook that the bus that took us out here was the LAST BUS of the DAY that would come out this route. After freaking out for a while (by the side of the highway in the middle of a ghosttown, near the Libyan border, without any clothes or blankets ready for the freezing Egyptian nights) we eventually managed to hitchhike with a Service Taxi that was rented out to some guys that were importing chirpy little Parakeets from Sweden to Libya…. They were taking the highway at full speed. Thanks to their speeding, we somehow managed to catch up with the SAME BUS THAT WE HAD EXITED HOURS EARLIER!! At a service station, just where the road makes a sharp turn inwards from Marsah Matruh. We again boarded that bus, the LAST BUS of the DAY to the Oasis town of Siwa.